And now let’s join RSG Principals Tara Matthews and Jim Simon do their impression of Jane Curtin and Dan Aykroyd debating the changes they’d like to see to help California communities, moderated by Suzy Kim, Senior Associate. Suzy: So, we know the new “gigamajority” of Democratic control in the California State Legislature and a new governor have got people buzzing about more tax increment financing tools to bring capital back to local communities. With EIFDs, CRIAs, NIFTI’s and other tools, does California really need “Redevelopment 2.0” and “Affordable Housing and Infrastructure Agencies” proposed by Assembly Bill 11 (Chiu), or Local-State Sustainable Investment Incentive Program proposed by Senate Bill 5 (Beall)? We’ve asked two of our Principals to debate these questions. First off is Tara Matthews, Principal from our Vista office. Tara’s work tends to focus around the areas of affordable housing. Tara is also a member of the San Diego Housing Federation. Tara will be debating with Jim Simon, Principal from our Irvine office who is also an Advisory Boardmember and technical committee co-chair of the California Association for Economic Development (CALED). Starting with you Tara, how do you feel the current tools available to communities meet the needs for affordable housing and economic developers? Tara: What tools? Just kidding, there have been efforts to generate a permanent source of funding, but I honestly don’t think they are very effective which is why we haven’t seen them utilized by many communities. Many of the tools double or even triple dip on revenue generated in communities, meaning that the “bucket of money” everyone is fighting for is very limited. This coupled with the costly process to get your hands on the bucket of money makes the tools very inefficient. Jim: Like Tara, I’d agree that the current tools offer limited financial incentives to communities unless other agencies participate. Suzy: And why are these issues in your opinion? Jim: Because we are asking a single taxing agency to bear the risk for stimulating economic growth that benefits all taxing agencies, as well as the state itself. This is particularly true in the case of economic development investments that can expand the economic base, provide living wage jobs, and fund needed infrastructure investment. As it stands now, communities with the greatest needs aren’t afforded any advantage over those that simply have the fortune of having a larger share of the property tax base. Tara: Plainly stated, there is no great incentive to use these tools to address economic and housing issues. After you run the numbers and look at various legal requirements and restrictions, the drawbacks often outweigh the benefits. Many of the other taxing agencies that have a greater share of the revenue just don’t want to part with it. Suzy: What kinds of changes do you feel are needed to make these tools better? Tara: Finding a way to make these tools benefit more of the taxing agencies and thus enticing more participation to reach common goals. One idea is to more clearly define a pass-through payment formula and removing “opt-in” provisions. Thus, making it easier to create a permanent financing source for capital projects. Jim: I think AB 11 needs to establish some formula for any pass-through negotiations, with either a fixed formula or a maximum share. Suzy: Ok, let’s talk about SB 5 and AB 11. Do you feel that either of these bills is going the help communities with affordable housing or economic development? Jim: I’m not sure yet. I like the idea of the State finally getting involved in supporting community development again, but there are a lot of unknowns here. Tara: TBD. SB 5 is very intriguing since it’s the most different from existing tools and provides a clearer path to funding. But I agree with Jim that it is exciting to see the focus on community development again coming from the State Legislature. Suzy: What would you like to see changed in SB 5 or AB 11 to improve the situation? Tara: Lessen reporting requirements if the entities illustrate collaborative solutions or meet specific goals, such as creating affordable housing in proportion to RHNA requirements working in collaboration with County or State entities, while improving surrounding infrastructure. I guess an easy way to say this is – reward good behavior. Some of the administrative burdens placed on communities makes it difficult to administer and takes away funding that could be used towards completing projects. Jim: First, it feels like the amount of oversight the State needs to play is a bit heavy to me. I also think they need to give local communities an opportunity to make a program work by requiring some basic level of participation from at least a few taxing agencies. And, maintenance should be an allowable use of expenditures. Suzy: Finally, how much should be set aside for affordable housing in your opinion? Jim: I personally feel that anything more than 50% is too much. There is very little funding available for local communities to create a sustainable economic development program to combat issues like gentrification, stagnant wages, and limited wealth building in communities. Tara: Well affordable housing is my passion and I would love to see as large of a set-aside as possible. But I also recognize that the communities must balance multiple issues and failing infrastructure is a major issue. Additionally, once housing is built those residents need a thriving community to live in, meaning that economic development is also a critical need. So, I think I would be willing to say that a 50/50 split would be fair, though I’d like to see the 50% that isn’t set-aside for housing spent in or around areas that are serving affordable housing projects and housing development. Suzy: So are you saying that affordable housing funding is a bigger priority than economic development? Tara: Since you are putting me on the spot, I have to stay true to my passion…yes. But I feel that a thriving community is at the intersection affordable housing, a strong business community, and workforce training options. When it comes to economic development, everything is interlinked. Jim: I believe affordable housing is a key aspect of a successful economic development program, but not the only one. Provides a total of $4 billion in funding for housing - $3 billion for existing state affordable housing programs and $1 billion for veterans’ home purchase program. What Does the Funding Go Toward? When will the Funding be Available? A Notice of Funding Availability (NOFA) is expected to be released in Spring 2019. Are in need of mental health services. Who Can Get this Funding? Applicants can only be counties (with or without a housing development sponsor). Available funding will be allocated by the State on both a competitive and non-competitive basis. The Competitive funding available makes up the majority at $1.8 billion, and total Non-Competitive funding is estimated at $190 million. The State issued a Notice of Funding Availability (NOFA) in October of this year for the first round of competitive funding. Applications will be due on January 19, 2019. No Place Like Home Program Guidelines are available at http://www.hcd.ca.gov/grants-funding/active-funding/docs/NPLHGuidelines082519-v1.pdf. June 14 marked the grand opening of The Depot at Santiago, a 70-unit affordable housing complex with 15 one-bedroom units, 24 two-bedroom units, and 31 three-bedroom units, with 10 units reserved to house formerly homeless families. The project, three-and-a-half years in the making and developed by long-time, well-renowned affordable housing developer C&C Development, is located across the street from the Santa Ana Transportation Center. 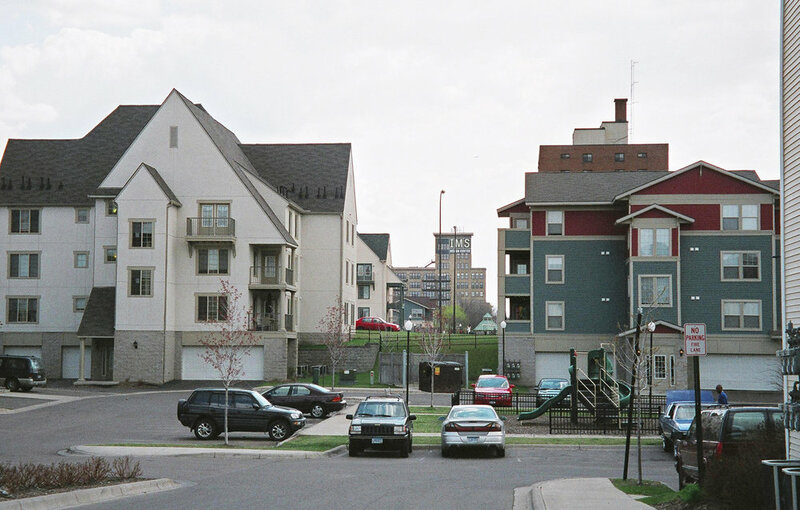 The Kennedy Commission, a group advocating for families in need of affordable housing, helped secure community approval for the project. The complex holds a community room, a laundromat open to the broader community, an outdoor play area for children, and a dance studio programmed by The Wooden Floor. We attended the grand opening with Greg. The momentous occasion featured speeches from Santa Ana council members and award presentations with state and national legislators. The Depot at Santiago houses families who make 30% and 60% of the area median income (AMI). The exterior seems indistinguishable from newer market-rate housing in the area. The model unit that was made available for tours during the event showed that the families occupying these units will be able to reside in spacious, dignified housing that provides the same amenities as market-rate housing. With 70 units and more than 1,800 applicants, the project represents a step in the right direction in addressing Southern California’s affordable housing shortage, but also highlights the long road ahead in providing an affordable place to live for those who need it. 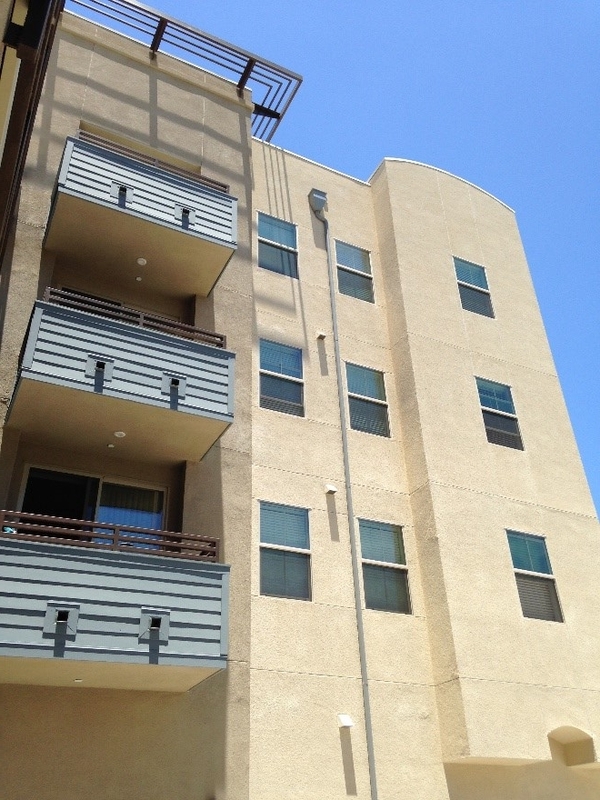 If you know of other great examples of new affordable housing developments, share them with us! California has an increasing need for affordable housing but not enough public dollars to fund that need. In response to a growing affordability crisis, the State Legislature is paying closer attention to existing funding sources and housing assets. This means housing successors are under increased scrutiny to maximize their assets on a local level. Even agencies caught up with local reporting need to think ahead to leverage assets and remain in compliance. Are you sure your housing successor complies with the law? Are there outstanding items you need to address? 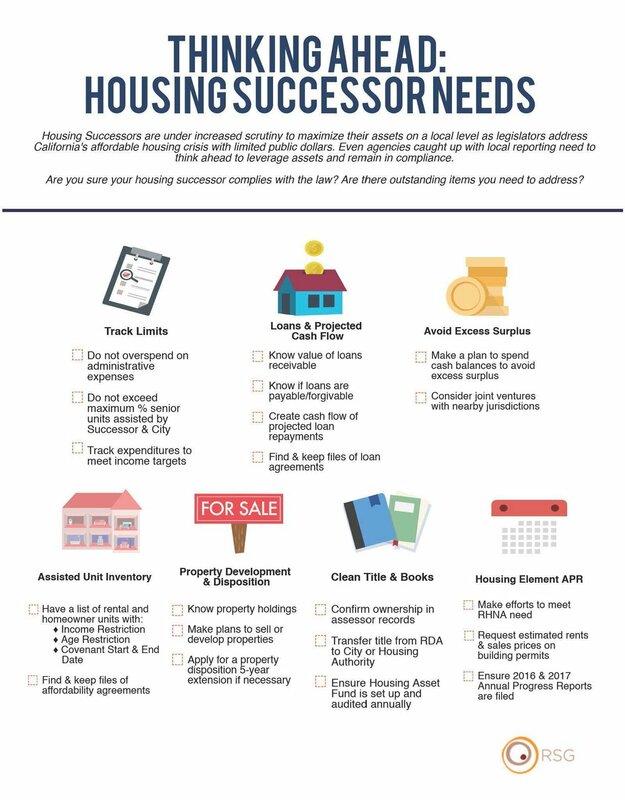 RSG will be sending each of our housing successor clients a Housing Diagnostic that evaluates your agency’s needs and identifies steps to maximize assets, assist low income households, and ensure future compliance. Meeting income and age targets, taking action to dispose of or develop properties, spending funds to avoid an excess surplus, and SB 35 streamlining are a sample of the topics covered. Producing results is more important than ever as HCD and State legislators take a closer look at existing housing funds. If RSG does not consult your housing successor but you are interested in a diagnostic, contact Suzy Kim, Senior Associate, at skim@webrsg.com or (714) 316-2116. Don't Miss out on Funding Opportunities - Complete your Housing Element Annual Progress Reports! With the passage of the 2017 Legislative Housing Package, the State has placed more importance on local government compliance with Housing Element regulations and the submission of Housing Element Annual Progress Reports (Annual Reports). Senate Bill (SB) 35 states that non-compliance with Annual Reports will now require cities and counties to use a streamlined and ministerial process for approving multi-family housing developments that satisfy the jurisdiction’s planning standards and requirements. Non-compliance occurs when either the jurisdiction has not issued enough building permits by income category to satisfy its regional housing need, or because it has failed to submit two consecutive Annual Reports. Additionally, the California Department of Housing and Community Development (HCD) has indicated that non-compliant jurisdictions may not be eligible to apply and receive funding for affordable housing through State administered programs, such as the funding generated from SB 2: Building Homes and Jobs Act. As of February 25, 2018, HCD has determined that ALL but 12 cities and counties are subject to SB35 streamlining provision. HCD updates this information at least quarterly to incorporate new or corrected data provided by jurisdictions. Annual Reports are due to HCD by April 1st each year. Although this deadline has passed, it is not too late to get into compliance. Some cities are retroactively filing reports for 2015 through 2017. Charter cities should note that even though charter cities were not required to complete Annual Reports until 2018, HCD believes that SB 35 streamlining requirement applies if a charter city has not completed an Annual Report for the last two years (2016 and 2017 ). We recommend that if you have not met this requirement that you do so now. Contact Suzy Kim, Senior Associate, at skim@webrsg.com or (714)316-2116, if you have questions or need assistance preparing your Annual Report to retain local control over housing development and avoid court sanctions. AB 1598: A New Affordable Housing Tool? On October 13, 2017, Governor Brown signed Assembly Bill (“AB”) 1598 into law. Legislators have said that the bill, which became effective on January 1, 2018, creates a new financing tool for affordable housing. But what is this new tool exactly? In some ways, the tool isn’t really new at all, but rather the expansion of an old tool. Building upon AB 2 from 2015, which allowed cities and counties to create Community Revitalization and Investment Authorities (“CRIAs”), AB 1598 allows cities and counties to create “affordable housing authorities.” Affordable housing authorities are authorized to use property tax increment and sales tax revenue contributed by consenting taxing entities to finance low- and moderate-income housing and affordable workforce housing. Authorities may issue bonds payable from the pledged revenues. Schools and successor agencies, however, are not permitted to contribute from their share of tax revenue. Affordable housing authorities must adopt and then implement a detailed affordable housing program. Unlike former redevelopment agencies, the authorities are not required to spend proceeds only in “blighted” areas. However, housing funds expended must be spent in proportion to the city/county’s Regional Housing Need Allocation (RHNA) requirements. A board made up of elected officials and local residents or employees is required to oversee each affordable housing authority. If you are interested in learning more about whether your community could benefit from forming an affordable housing authority, please contact us at RSG today. We’re happy to help. As the California housing market continues to suppress any effects of the subprime mortgage crises, housing expenditures have swelled to levels that are considered not affordable for an alarming number of citizens. Counties such as San Francisco, San Jose, Los Angeles, Orange, and San Diego are among the least affordable markets with more and more households spending well beyond 30% of their income to keep a roof over their heads. In San Diego County, 47% of all occupied units are spending more than 30% of its income on housing expenditures according to the U.S. Census Bureau, American Community Survey 5-Year Estimates. That number is even higher for renter-occupied units at 57%, with five cities throughout the County over 60%. 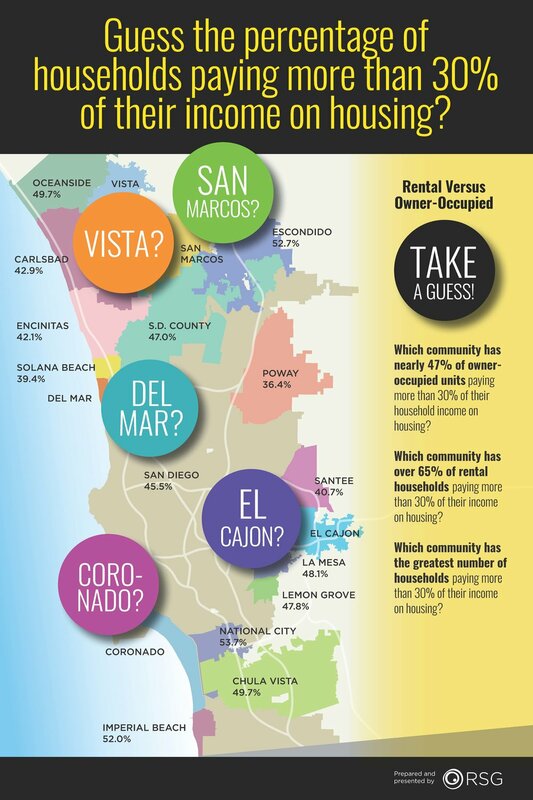 Vista (44% owner, 65% renter), San Marcos (47% owner, 63% renter), and Escondido (41% renter, 64% renter) each rank among the Top 5 least affordable cities for owner- and renter-occupied units compared to Poway (31% owner, 52% renter) and Solana Beach (32% owner, 51% renter) which are among the most affordable in both categories. The City of San Diego is among the average at 36% owner-occupied and 54% renter-occupied units spending more than 30%. The growing concern for housing affordability in San Diego County has become a wide-spread issue that is no longer isolated to the less affluent communities. The need for local governments to assess their current housing stock is among the first steps toward finding a solution that is right for its residents. An unprecedented number of housing bills were passed during the recent legislative session. The review of all of these bills can be daunting with everyone’s busy schedule. Here’s a breakdown of what you need to know about each major bill with a link to the legislative summary for more detailed information. Enjoy! More than a dozen bills designed to help communities in California combat an affordable housing crisis were approved by the California Legislature on Friday, September 15, 2017 and sent to the Governor for his approval. This past year marks the Legislature’s “Year of Housing,” wherein more than one hundred housing proposals were introduced and debated in order to provide for assistance in funding for affordable housing development, streamlining local government approval of housing projects, restoring authority to impose inclusionary housing requirements on private housing developers, and creating more state-wide Anti-NIMBY laws. Governor Brown is expected to sign at least three major bills in the package: SB 2, SB 3 and SB 35. SB 2, by Sen. Toni Atkins, D-San Diego, would provide for a “permanent source” of funds for affordable housing development through the creation of a $75 fee on most recorded documents (except for home sales). This fee is expected to generate $200-300 million per year that can be used for affordable housing development. Half of the funds generated in 2018 would be made available to local governments for updating planning documents and zoning ordinances in order to streamline housing production, and the other half would go to the state for homeless assistance programs. Beginning in 2019, 70% of the funds would be directly allocated to local governments for a variety of affordable housing programs, and the other 30% would be used by the state for mixed income multifamily housing, farmworker housing and other programs. SB 3, by Sen. Jim Beall, D-Campbell, would place a $4 billion statewide housing bond on the November 2018 state ballot, with bond proceeds to be used to fund a number of existing housing programs: $1.5 billion of the funds would go to the state’s Multifamily Housing Program for affordable housing development loans, $1 billion of the funds would go to the state’s CalVet veteran’s home loan program, with the remainder of the funds allocated for the CalHome down payment, farmworker housing, transit-oriented development, mortgage assistance programs and infrastructure supporting infill housing. SB 35, by Sen. Scott Wiener, D-San Francisco, creates a streamlined approval process for housing developments in communities that have not approved enough housing to keep up with regional fair share housing goals. Eligible projects do not need to obtain conditional use permits and can take advantage of lower state-mandated parking standards. To take advantage of this process, the proposed development must be on an urban infill site, the development must not be in the coastal zone, agricultural land or other sensitive areas. Furthermore, the developer taking advantage of this streamlined process (an optional right for the developer) must pay prevailing wages and, in some cases, certify that it will use a “skilled and trained workforce” to complete the project. Critics of SB 35 believe that it will impose extraordinary costs on affordable housing construction, thus hindering the legislature’s ultimate goal. Governor Jerry Brown has until October 15, 2017 to sign or veto these bills. Do you think these bills will adequately fix housing issues in your local community? What are your local communities doing to address these issues, and how do these actions align or conflict with these proposed bills? We would love to hear your thoughts. Please share them with tmatthews@webrsg.com. A total of 91 proposed affordable housing projects are hoping to win 9% federal tax credits in California according to second round data from the California Tax Credit Allocation Committee (TCAC). In September, TCAC will announce the selected projects to receive financing from the largest source of affordable housing subsidies available in California. Awards are typically provided based on tiebreaker scoring and allocations to certain targeted categories (or “buckets”), including rural and at-risk projects. A senior project in the city of San Diego had the highest tiebreaker score at 76.166%. A senior project in the city of Placerville had the lowest tiebreaker score at 4.978%. This project competes in the rural bucket. The average score for the rural bucket is 25.175%. The rural set-aside has the lowest average score of all set-asides. The at-risk set-aside has the highest tiebreaker score at 60.300%. Projects that do not win tax credits in set-aside buckets compete in geographic buckets. Of all geographic buckets, the South and West Bay Region was the most competitive. The average score in this bucket is 68.412%. The city of Los Angeles is the geographic bucket with the lowest score at 38.265%. This round the San Francisco County region had only one submission, despite being an area with great demand for affordable housing. On the other hand, the Central Valley Region had ten applications (the most of geographic buckets). The largest development that was submitted is 180-units, and the smallest was 10-units. Seventy-six of the projects are new construction, and 12 are acquisition rehab. Most applications are spread throughout the geographic regions. However, several cities had more developments than others Los Angeles had 5 submissions, 4 in San Diego, and 3 in Santa Ana. Although 91 projects submitted for tax credits this round, only a small portion will be funded this year. This does not seem like a lot given the serious need for housing and California’s significant low-income population. Hopefully, we will have greater success with State and Federal Legislatures doing more to provide subsidies and other incentives to build additional units. Written by Greg Smith, a Senior Associate at RSG, Inc.